They are a series of special levels that appear only in the 3DS version of Sonic Lost World. They are loosely similar to the special stages of Sonic 3 & Knuckles and Chaotix. The stage is an empty place like a space with blue, rainbow, red and yellow spheres floating. 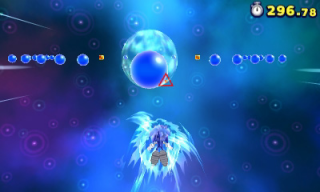 While the emerald chaos out in the open, it is protected by a "force field" that it stays until the player to collect all the balls. Collecting 5 of a certain color, a magnetic field arises drawing near realms. If the player does not keep this period of time or not replace the ball for a single color, the field will disappear. There are also items which increase or decrease the player time. The player is able to move Sonic using the gyroscope, can accelerate the speed or use the boost. This page was last edited on 13 September 2017, at 20:11.